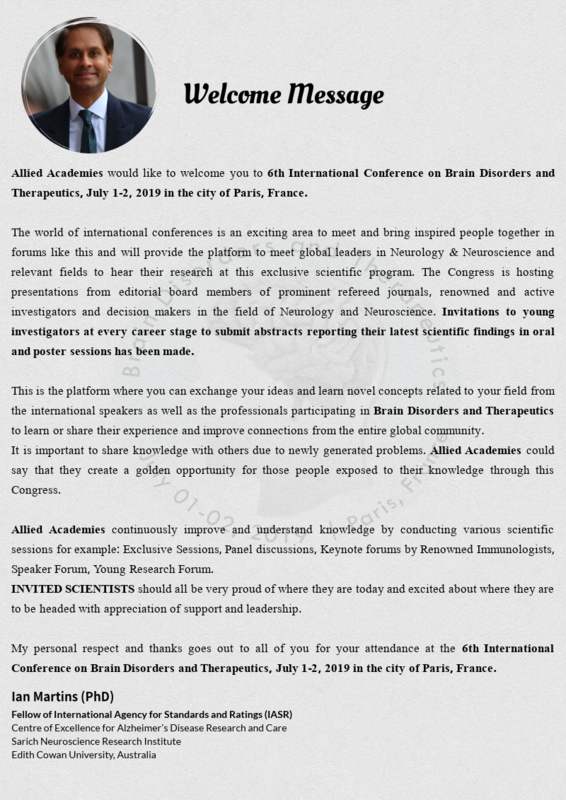 We exuberantly welcome and invite all delegates, speakers, exhibitors and sponsors from across the world to participate in the 6th International Conference on Brain Disorders and Therapeutics which is scheduled to be held from July 1-2, 2019 in Paris, France. The conference has been placed along meticulously to fulfill the ennobling standards of our attendees and thus provides a felicitous forum that ensures interactive congregation of knowledge and intellect regarding the path-breaking researches on brain disorders being conducted across the world. Our aim is to spur the progress of efforts to explain the untouched science behind the mystery of brain disorders, their mechanism, diagnosis, treatment and management inclusive of an active colloquy about the recent advances in the realm of brain disorders. The conference will extend a platform for multidisciplinary exchange of information to battle brain disorders and shed light on the most sought after scientific discoveries in all its aspects. It will not only help you expand your horizon for associating with colleagues from across the world but it also comes with a well-designed program with sessions which impart the scope for discussion of cutting-edge researches in this field. Neurologists, neurooncologists, psychiatrists, rehabilitation therapists, professors, doctors, research scholars and students. Business professionals and CEO’s and R&D Heads of industries are promised a very productive experience in expanding your network as well as resources. We welcome anyone who would like to make the best out of this amazing networking opportunity. We would once again like to convey our heartiest welcome to the 6th International Conference on Brain Disorders and Therapeutics and eagerly look forward to seeing you in Paris! Brain is the most complex and sensitive organ in the body. Minute damages to the brain might cause devastating consequences leading to several brain disorders. It may occur in early childhood causing developmental disorders such as autism and dyslexia .Psychiatric diseases such as depression and schizophrenia are typically diagnosed in teens or early adulthood and as we age we become increasingly susceptible to Alzheimer’s disease, Parkinson’s disease, stroke, and other diseases. This session encourages a discussion on the structural and functional aspects of the brain and the various dimensions of disease development. Early diagnosis of brain disorders is crucial to determining the prognosis and treatment for the patient. Over the decades, there has been immense advancements in the diagnostic tools and strategies for various brain disorders. This session brings together researchers from around the world and provides a platform for the discussion on newer strategies of early diagnosis of various brain disorders to ensure better survival rates of individuals. The Pathophysiology of Brain disorders is influenced by multiple factors such as Molecular and cell system, Altered cerebral hemodynamic, Cerebrovascular auto control, Cerebral oxygenation, Excitotoxic cell harm, Inflammation, Cerebral metabolic brokenness and Changes in coordination or adjust. The objective of this session is to deliberate about : Neuroimmunology, Neuro virology, Neuro-invulnerable pathology, Neuro-insusceptible Interaction, Neuropharmacology and Therapeutics, Neuropeptides and Neurohormones, Neurobiology of Brain Disorders and Neuro phonetics and Neuroheuristics. Neurochemistry accomplishes the procedures occurring in the sensory system and nerve tissues. One of these measures is Neurotransmission, wherein, the communication at the neurotransmitter occurs with the assistance of neurotransmitters, for example, Dopamine, Acetylcholine, Norepinephrine, Glutamate, Serotonin, Gamma-aminobutyric corrosive (GABA), Endogenous opioids and so forth. Movement of particle channels aids neurotransmitter receptors to get the signs. This system is changed by the numerous medications, as a treatment procedure for neurological disorders. The worldwide offers of medications to treat dynamic dementia with other neurological variations from the norm anticipated that would reach $537.2 million out of 2012 and $913.7 million by 2017, at a CAGR of 11.2% over the five-year gauge period. Brain disorders in the form of neurodegenerative disorders are prevalent in the geriatric population across the globe and have posed challenging problems both in the developed as well as developing countries in terms of the medical services offered. Alzheimer’s disease and Parkinson’s disease are the most common brain disorders affecting the geriatric population. In addition, these brain diseases are accompanied by a host of other disorders in the elderly. For instance, patients with Parkinson’s disease are at a high risk of developing valvular heart disease. 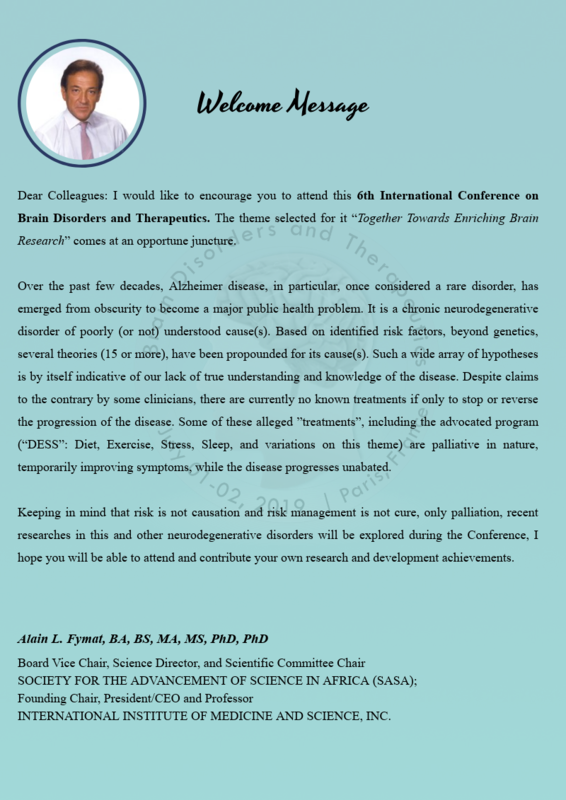 The session on neurodegenerative disorders and geriatrics is especially essential to be included in the conference due to the rising problems of lack of proper disease management in the ever-increasing geriatric population globally. Understanding the genetics behind brain disorders is vital to determining their pathophysiology and development; narrowing down to the most efficient treatment options and building personalised treatment alternatives based on the genetic makeup of the patient. Identification of causative genes for brain disorders such as Parkinson’s disease and Alzheimer’s disease has exponentially expanded the possibilities of therapy by targeting the causative genes and either inhibiting or overexpressing them depending on the disease manifestation. This session is formulated to discuss the significance of genetics in brain research as well it provides a platform to congregate diverse research attempts in the field of neurogenetics. Dementia is not a particular illness. It represents a class of symptoms which are linked to a decline in memory or other reasoning abilities sufficiently serious to diminish an individual’s ability to carry out daily activities. Alzheimer’s disease accounts for 60-80 percent of dementia cases. Vascular dementia is the second most common type of dementia. However, there are numerous different conditions that can cause indications of dementia including some that are reversible, for example, thyroid problems or nutrient inadequacies. The main cause of dementia is a damage to brain cells. Different types of dementia are linked to different regions in the brain. For example, hippocampus is the central region for learning and memory; and these cells are often the first to be damaged. Therefore, loss of memory is one of the first signs of Alzheimer’s disease. While manifestations of dementia may largely differ among individuals, no less that two of the following symptoms must be fundamentally hindered to be viewed as dementia – memory, language and communication, capacity to pay attention and concentrate, thinking and judgement and perception of vision. The neural network shows anatomical associations connecting an arrangement of neural components though utilitarian availability is by and large gotten from time arrangement perceptions and portrays examples of measurable reliance among neural components. Cerebrum availability is in this way vital to illustrating how neurons and neural systems process data. Cerebellum and brain stem are two of the three primary parts of the human brain, the third one being cerebrum. Every one of these three sections of the cerebrum performs diverse functions. This session encourages a discussion on the structural and functional aspects of the brain and the various dimensions of disease development. Computational models are being applied to elucidate disruptions in the brain leading to brain disorders. This approach inculcates the fields of genomics, proteomics and bioinformatics to identify the pathobiology and development of brain disorders. 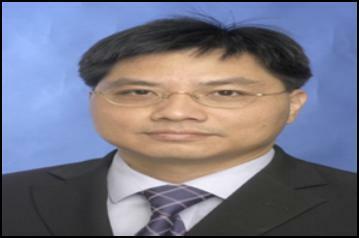 The computational models research strategy is applied largely to identify and validate biomarkers for specific neurological disorders which promise newer diagnostic and therapeutic alternatives. This session anticipates the congenial involvement of neurologists, bioinformatics, biomedical engineers to come together and discuss the potential applications of computational neuroscience in addition to what is already known. 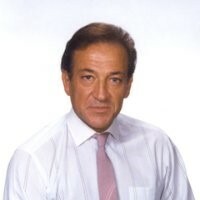 The primary focus of neuro-oncology research around the globe includes the identification of risk factors which result in primary brain tumorigenesis and progression; identification and evaluation of biomarkers to diagnose brain malignancy along with elucidating the prognosis and response of the patients to therapy; development of new approaches that enhance the overall survival and ensure optimization of the patient’s quality of life. This session is of particular significance considering its interdisciplinary context which demands the expertise of neurosurgery, neuropathology, radiation oncology, medical oncology, neuroradioloogy and related fields. The session ensures a successful exchange of knowledge from the varied disciplines to better understand and address the complications of brain tumors. Neurosurgery being a practical procedure for treating brain disorders and injuries has seen profound, unending advances in terms of the tools and technology used. These advances promise to enhance the accuracy of diagnosis and intraoperative procedures. 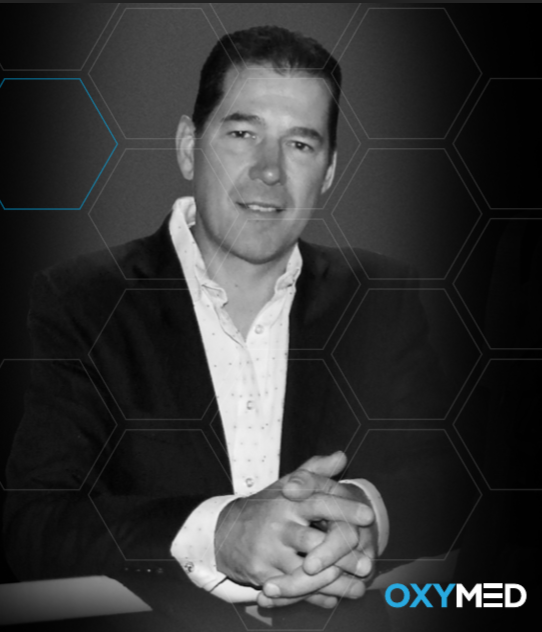 Neurosurgery has come a long way from being regarded as one of the most complex procedures in the medical field to advances in simulation technology where neurosurgeons will be able to “rehearse” a surgical procedure or augment the actual surgery. The conference opens the house for discussion on various aspects of neurosurgery and related fields through this session. Neurosurgeons from across the world can gather and be enriched with the myriad of advancements taking place each second in the field of neurosurgery. The objective of this session is to deliberate about nursing practices that can assist and play an important role in the treatment of Brain Disorders. This session aims at discussion about: Advance Practice Nursing, Geriatric Nursing, Movement Disorders, Multiple Sclerosis, Neuro-Oncology, Neurotrauma, Pediatrics Nursing, Spine and Stroke. Pediatric neurology directs to a branch of medicine that revolves around the diagnosis of neurological conditions in neonates (babies), newborn children, kids and teenagers. By and large, about 40-50% of the patients have epilepsy, while 20% have learning or developmental disabilities and 20% suffer from headaches. The rest are treated for uncommon or rare conditions, for example, metabolic or hereditary disorders. The opportunities open to both clinical and basic researchers in this field are proceeding to expand. Headaches can be categorised into primary headache, secondary headache and cranial neuralgias, facial pain and various headaches. Primary headaches incorporate cluster, migraine and tension headaches. Migraines are extreme, repeating, and agonizing headaches. They can be gone before or joined by sensory warning signs and other symptoms. According to a report by the American Migraine Association, they affect 36 million Americans, or around 12% of the population. Rehabilitation of an afflicted brain can nurture the reconnection of damaged neural circuits. The aim of rehabilitation involves supporting the patient to revert to the highest degree of function and self-dependence. It also intends to enrich the individual’s quality of life emotionally, physically and socially by assisting them with daily activities, engaging them in speech therapy and in activities to improve muscle balance and control. This session in our conference encourages rehabilitation groups, neurologists, counselors, psychiatrists and related experts to participate in the discussion to formulate new rehabilitation approaches or revamp the existing ones to culminate into a faster and effective recovery. Numerous therapeutics have emerged over the decades as scientists are progressively making themselves acquainted with the complexity of neural networks. Much recent and innovative strategies include the application of nanotechnology to avert the onset of Alzheimer’s disease; using human monoclonal antibodies as a new approach to inhibit causative proteins and enzymes in brain disorders and developing epigenetic therapeutics. Innovative therapeutic approaches are key to developing safe and effective cure for brain disorders. This session indulges researchers in an interactive congregation to come up with novel and precise therapeutics for brain disorders. The realm of neuroscience has witnessed the emergence of diverse innovative and highly productive technologies in the last couple of years and will continue to experience impressive innovations in the future. Brain-computer interfaces are already assisting paralysed patients to carry out simple tasks while deep-brain stimulators are relieving Parkinson’s disease patients from the tremors. Recent technological advances in diagnosis and treatment is an essential session of the conference which aims to bring together research and development carried out in this field from across the globe and share ideas to put forth the most efficient diagnostic and treatment strategies for brain disorders. Animal models have been used in all fields of medical research to study the progression of diseases inside the organism. Brain researchers use animal models to analyse various clinical conditions in animals which mimic that of humans and derive potential therapeutic strategies for treatment. This session opens the house to discussion about successful researches conducted on animal models and reasons out the conflicts in application of these outcomes on the human brain. Neurofeedback is additionally called EEG biofeedback, and it's especially valuable for treating an assortment of neurological conditions. EEG input is normally used to treat epilepsy, rest issue, nervousness, stress, ADHD and horrible brain wounds. Case Reports on brain disorders aim to conduct an evaluation of signs, symptoms, diagnosis, treatment, and follow-up of a patient for a brain disorder. Case reports are accounted as a proof of evidence for the patient in the clinical field. They assist vitally in the field of research for brain disorders. This session will focus on the ways to improvise the current workflow of documenting case reports and performing clinical trials. The global cost of brain and mental disorders was estimated to be $8.5 trillion in the year 2010. The cost of brain disorders and diseases in US alone is estimated at $1.5 trillion which is about eight percent of the gross domestic product. As of 2010, the total cost of brain disorders in Europe was €798 billion out of which 37% of the fund is spent on direct health care, 23% is non-medical cost while 40% is spent on all indirect expenditures. Brain disorders cost higher than cardiovascular disease, cancer or diabetes. These disorders are predicted to be responsible for greater than half of the consummate economic burden from non-communicable diseases in the coming decades. 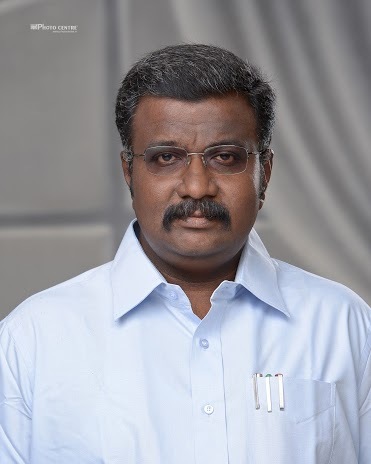 Also keeping in mind that those suffering from brain disorders and mental illnesses are highly susceptible to cardiovascular diseases, respiratory diseases and diabetes, the cost for brain disorders and mental illnesses is reckoned to be even higher. According to 2010 reports, neurological disorders constituted 3 percent to the global burden of diseases and mental and behavioural disorders accounted for 7.4 percent. The leading neurological disorders namely migraine, epilepsy, Parkinson’s disease, dementias account for about 70 percent of the burden. The top 10 countries involved in neuroscience research ranked according to their wealth of research are USA, UK, Germany, Japan, Canada, China, Italy, France, Australia, Spain. Neuroscience research in France is ranked third in Europe and seventh in the world. About 625 research teams are actively conducting research in the field of neurology, cognitive science, neuroscience and psychiatry at various institutions. Of the many projects funded by various organisations for research in healthcare and biology, a greater proportion is found in the field of neuroscience. French researchers are foremost in the field of neurosurgery and in the growth of brain-machine interfaces. The capital city is a hub for research in healthcare as much as it is the hub for fashion. Being an impressive blend of both worlds, Paris offers a great platform to host healthcare conferences owing to a large number of internationally acclaimed research institutes and universities. Its state-of-the-art laboratories covering all scientific disciplines makes Paris a very favourable destination for scientific meetings. At the outset, we extend our heartfelt gratitude to the exceptional keynotes, speakers, conference attendees, media partners, associations, students and guests who made Brain Disorders 2018 a successful endeavour. AAC hosted the 5th International Conference on Brain Disorders and Therapeutics during November 5-6, 2018 at Holiday Inn Edinburgh which was set around the theme “Ensuring the Future of Brain Health”. 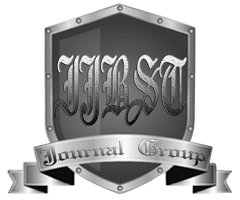 Active and responsible participation of the Editorial Board Members of supporting International Journals as well as that of the preeminent academic researchers, professors, doctors and innovators in the field of Neurology focusing on Brain Disorders is entirely creditable for the success of this event. With the successful conclusion of Brain Disorders 2018, AAC is delighted to announce the 6th International Conference on Brain Disorders and Therapeutics to be held during July 1-2, 2019 at Paris, France. Delegates are personally responsible for their belongings at the venue. The Organizers will not be held responsible for any stolen or missing items belonging to Delegates,Speakers or Attendees; due to any reason whatsoever. Press permission must be obtained from Allied Academies Conferences Organizing Committee prior to the event. The press will not quote speakers or delegates unless they have obtained their approval in writing. The Allied Academies is an objective third-party non-profit organization. This conference is not associated with any commercial meeting company. For securitypurposes, letter of invitation will be sent only to those individuals who hadregistered for the conference. Once your registration is complete, pleasecontact braindisorders@neurologymeeting.comto request a personalized letter of invitation. Regardingrefunds, all bank charges will be for the registrants account. All fully paid registrations are transferable to other persons from the same organization, if registered person is unable to attend the event. Transfers must be made by the registered person in writing to contact@alliedacademies.com. Details must be included the full name of replacement person, their title,contact phone number and email address. All other registration details will be assigned to the new person unless otherwise specified. Registration can be transferred from one conference to another conference of Allied Academies if the person is unable to attend one of conferences. E-PosterPayments will not be refunded.